Low-light, poor quality surveillance is now something of the past. With the help of the Longse Starlight cameras, darkness becomes visible and your properties can always be kept under control. 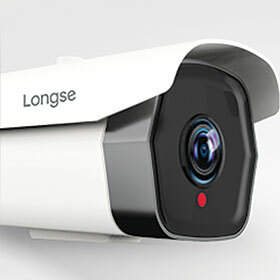 This Longse Starlight camera adopts a 1/2.8-inch Starvis back-illuminated CMOS sensor, with a 2 MP HD lens and delivers 1920 x 1080 full colour HD quality under poor light conditions. The core feature of the starlight camera is the light sensitivity technology. This is obtained by noise suppression and is the latest in sensor technology. Furthermore, the cameras’ WDR (wide dynamic range of light) and IR-Cut (built-in infrared cut-off filter) prevents over exposure and colour deviations. There are various uses for the Longse Starlight camera, from parking lot security, driveway security, security at harbours, to high-volume traffic areas and city centres.